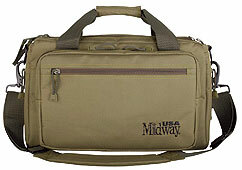 MidwayUSA recently sent us its new Compact Competition Range Bag for review. Overall, we were very impressed. The bag is made from a strong, heavy-duty PVC-coated polyester, with high-quality, large-toothed zippers. A comfortable, curved carry strap is secured by sturdy, all-metal clips. The “build quality” is visibly much better than most range bags on the market. I wish my airline carry-on bags were built as well as this. The bag is offered in black for $26.99 or olive-drab for $39.99. We tested the handsome olive-drab version which is a good match for our khaki AIM 60 Tactical Drag Bag. The details of this bag reveal smart design and quality construction. On the bottom, two plastic foot pads with ¼” high ribs are stitched to the fabric for grip and moisture standoff. On the inside of the bag a removable, waterproof sole further protects the contents. On both ends of the bag are full-width zippered pockets, with a handy clear identification window on one side. Metal D-rings above the end pockets provide solid attachment points for the heavy-duty shoulder strap. The shoulder strap pad has a rubberized underside that keeps the strap from sliding off your shoulder. 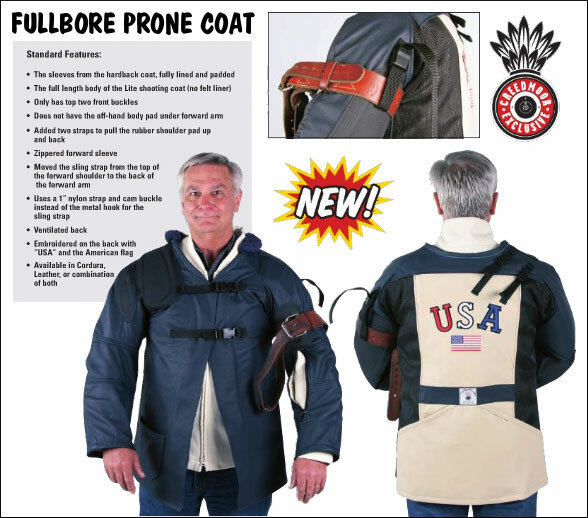 The main compartment is conveniently accessed through a Velcro end closure plus two long, parallel zippers whose pull-tabs are connected with a cord. The main compartment is big enough to hold two large MTM Caseguard R-100 series rifle ammo boxes, with plenty of room left over. Unfortunately, there’s no easy way to lock any compartment on the bag. That’s too bad, since some jurisdictions require handgun cases to be locked during transport. To test the carrying capacity of the MidwayUSA bag, we loaded it up with 100 rounds of rifle ammo, 600 rounds of centerfire pistol ammo, 500 rounds rimfire, earmuffs and FOUR pistols tucked in the padded side sleeves. All that gear fit nicely with room to spare. (We recommend putting handguns in protective sleeves if you load two per side). The padded, full-width, zippered main pocket keeps seven spare magazines organized and protected. On the reverse side of the bag, a similar, full-length padded pocket provides undivided storage space. That large outside pocket also has a zippered compartment with dividers for pens and a small notepad. The bag’s many pockets make it easy to organize miscellaneous gear such as staple gun, target stickers, small binoculars, timers, and radios. The durable fabric, thick padding, heavy-duty zippers, and quality stitching should deliver many years of hard duty. This is a bag that holds its shape more like a luggage piece, not a thin bag that will squash flat and lay on the shelf out of the way when not in use. The black Compact Range Bag is available now. The olive drab version we tested should be in in stock on 5/28/2010. 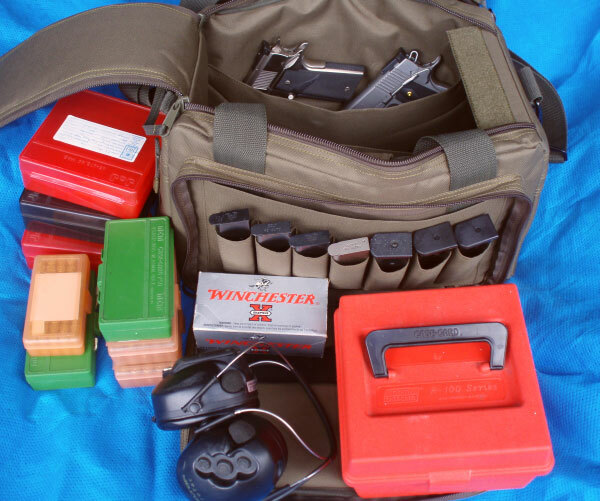 Share the post "Gear Review: MidwayUSA Compact Competition Range Bag"
The NRA Training Counselor Guide (TC Guide) is the “textbook” used for training new NRA instructors. It includes lesson plans and course outlines for Basic Instructor Training, plus NRA Instructor qualifications and assessment exercises. The new THIRD Edition of the TC Guide (complete with PowerPoint CD) has just been released. 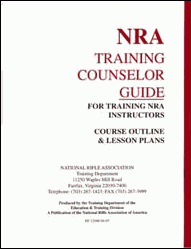 Shooting organizations involved in training NRA Instructors should replace older TC Guides with the new Third Edition. The new TC Guide incorporates several policy changes and formatting has been standardized. The new edition also allows revisions to be posted as addenda, making it easier to update. The print version of the new TC Guide (3rd Ed.) is available from the NRA program materials center for $45.00. Later this year the NRA hopes to release a digital version of the TC Guide at a reduced cost. 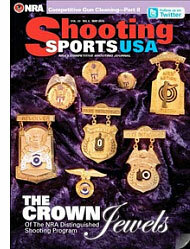 Share the post "New Edition of NRA Training Counselor Guide Released"
The latest May 2010 digital edition of Shooting Sports USA is available, and it is definitely worth reading. This May issue contains the much-anticipated sequel to Part One of Competitive Gun Cleaning. Part Two of the series on Gun Cleaning can show you how to clean more effectively, with longer lasting results. Shooting Sports USA Editor Chip Lohman explains that: “Advances in chemicals for the marine, auto, and airline industry have benefited shooting sports in general and competitive shooting specifically”. There are many new products that speed up the cleaning process, so you can spend more time shooting, and less time scrubbing barrels. A “must-read” profile of legendary High Power shooter Middleton (‘Mid’) Tompkins. A Guide to the Distinguished Shooting Program for all 5 NRA disciplines. 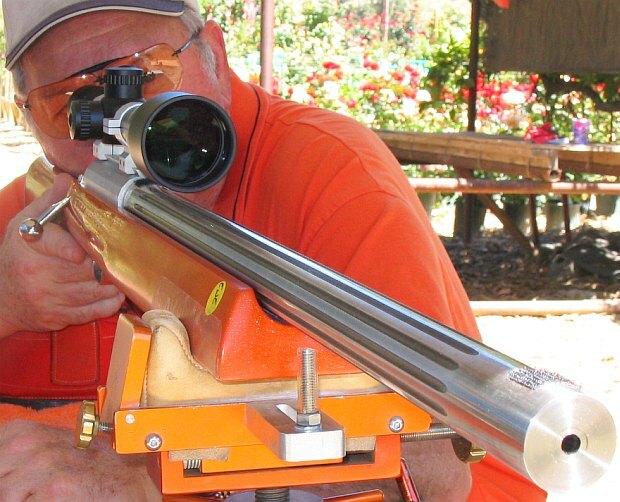 An Introduction to .22LR Rimfire Benchrest Shooting, with resource links. Complete schedules for NRA competitive matches nationwide — this covers a wide range of disciplines, including high power, smallbore, black powder cartridge, silhouette, cowboy silhouette, and pistol matches. 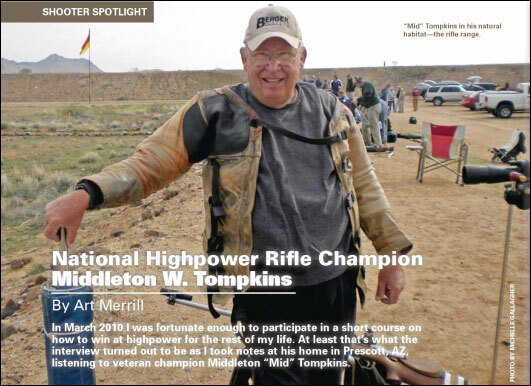 Share the post "New FREE May Edition of Shooting Sports USA"
The Disabled Shooting Services of the National Rifle Association will host the second annual Open Range Day at the Ben Avery Shooting Facility in Phoenix, Arizona, on May 8, 2010. Open Range Day is an all-inclusive event where certified trainers and instructors introduce a variety of shooting sports to people with physical disabilities. Sponsors provide shotguns, rifles, pistols and air rifles for the participants. Open Range Day begins with a safety clinic led by NRA Certified Instructors. Participants then have the opportunity to learn the proper way to shoot shotguns, rifles, pistols, and air guns. “The important thing is for everyone to explore their personal potential on the range and simply have fun,” explained Ross. “We wouldn’t be able to hold such an event without our corporate sponsors,” said Ross. “Ruger, Savage, and Davidson’s are donating the use of their firearms, White Flyer Targets and Birchwood Casey are donating targets, while Kowa Optimed, Pyramyd Air, Lapua and Remington are donating spotting scopes and ammunition.” For more on Open Range Day, contact Vanessa Ross at (703) 267-1495 or email disabled_shooting [at] nrahq.org. CLICK HERE to learn more about NRA’s disabled shooting programs. If you’d like to volunteer as an Open Range Day assistant, click the link below. 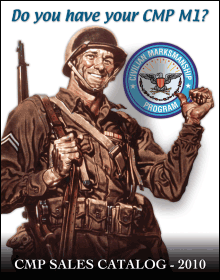 Share the post "NRA Open Range Day For Disabled Shooters May 8th in Phoenix"
One of the great things about ordering an M1 Garand or rimfire Target Rifle from the Civilian Marksmanship Program (CMP) is that, if you satisfy all the purchaser requirements, the gun can be shipped directly to your home (in most states). You are NOT required to receive a CMP surplus rifle through an FFL, at least in most jurisdictions. Unfortunately, that situation has changed in New Jersey. The State of New Jersey is now requiring that CMP guns be first shipped to Federal Firearms License-holders who also have a current New Jersey State License. Effective immediately, rifles sold and shipped to NJ residents must be shipped to NJ licensed firearms dealers. Customers should provide the CMP with copies of the dealer’s FFL and NJ State license, along with the CMP order form. This applies to all rifle orders the CMP has already received and not yet shipped. [However], New Jersey residents who visit either CMP store may purchase and pick up rifles without the necessity of going through a NJ licensed dealer. Share the post "New Jersey Now Requires CMP Rifles to Ship to NJ-Licensed FFLs"
If you compete in matches with time limits for record fire, a timer with both count-down and stopwatch functions comes in very handy. Creedmoor Sports sells a nice, basic battery-powered match timer for $26.95, item C1033. If you don’t want to pack an extra piece of kit, and want something more versatile, consider a watch with a count-down timer and stopwatch. 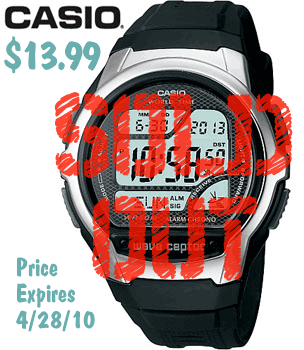 Right now BlingDaily.com is selling a Casio Waveceptor Watch with an easy-to-use countdown timer AND a chronograph stopwatch. For the next 9 hours only, the price on this watch is just $13.99! Typical selling price is about forty bucks. One cool feature of this Waveceptor watch is that it automatically sets the correct time, to the second, by “tuning in” to the official “Atomic Time” radio signal (in both the USA and the UK). The watch also displays world time in 48 different cities around the globe. That is handy for travelers. SORRY — WATCH is SOLD OUT! Act now if you want the watch for $13.99. The offer expires this afternoon. This Editor owns another Waveceptor watch. The auto time-check feature really works. For months, my Wavecepter has been accurate, to the second, when checked against the National Institute of Standards and Technology (NIST) atomic clock. Share the post "Waveceptor Watch with Countdown Timer — $13.99 Today Only"
The final results of the 2010 NBRSA 600-Yard National Championship held at the Sac Valley Shooting Center on April 23-25, 2010, are now available. Click the link below to download an MS Word file with complete scores. Share the post "Final Results from NBRSA 600-Yard Nationals"
One of the nation’s major multi-gun competitions took place this weekend at the new Rockcastle Shooting Center in Park City, Kentucky. The Sabre Defense Blue Ridge Mountain 3-Gun Championship attracted scores of top shooters, drawn by over $250,000 worth of gear and certificates on the prize table. The “Blue Ridge” is a hugely popular match — probably the biggest 3-gun event in the country. Despite rainy weather, the competitors fought through 10 stages over three days. On Sunday, among the top stage performers, 32 shooters were selected for the shoot-off. These 32 dueled in elimination matches until just two competitors were left: Taran Butler and Erik Lund. Erik and Taran then battled against the clock in a final stage run. When the dust settled, Taran Butler took the championship by a few seconds, earning a $5000.00 check from Leupold. As the Blue Ridge 3-Gun Champion, Butler earned a spot at the 3-Gun Nation Finals in September, which will be held in conjunction with the USPSA 3-Gun Nationals. 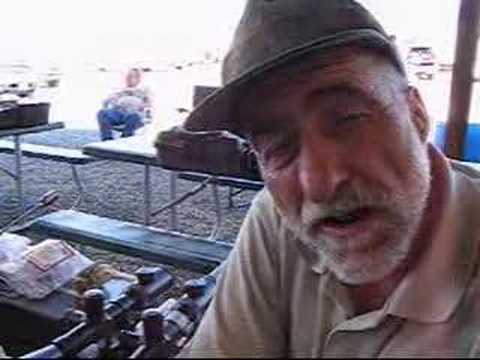 Below are images from the 2009 Blue Ridge Mountain 3-Gun event. 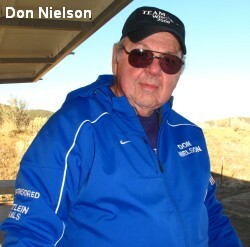 Share the post "$250,000 in Prizes for Blue Ridge Mountain 3-Gun Competitors"
NBRSA Long-Range BR Hall-of-Famer Don Nielson earned his second NBRSA 600-yard championship this weekend in Sacramento, California. Don took the overall title, which counts score and group results for both Light Gun (LG) and Heavy Gun (HG). 6mm Dasher shooters Richard Schatz and Robert Hoppe finished second and third overall, respectively. Potential new records were set at the match, with possible new records by Nielson in LG Group Agg, LG Score Agg, and (possibly) 12-target Agg. Along with winning the Championship, Don placed first in LG Group, first in LG Score, second in HG Group, and second in Two-Gun Group Agg. Nielson also shot the smallest LG group, a 1.4″ group with four of five shots in slightly over 1/2 inch! Don shot two 6.5×47 17-lb rifles, one in Light Gun and one in Heavy Gun. (He shot two near-identical rifles so he didn’t need to clean between LG and HG relays). For his pair of 6.5x47s, Don loaded Alliant Reloder 15 powder, with Federal 205M primers, and Berger 130 VLD bullets “right out of the box.” Don’s rifles featured Kelbly 1000-yard stocks, Bartlein 30″ barrels, and March 10-60x52mm scopes. Below Don Nielson is shown testing in 2008. Don shot this gun in the match, but it has a new Bartlein barrel. The Match was well-attended — 46 of the nation’s top mid-range shooters competed. Don Nielson said conditions were “pretty nice until the third (last) relay on Sunday”. Don felt that winds didn’t top 10 mph until late on Sunday. Don credited both his guns for performing very consistently and he wanted to acknowledge his fellow shooters: “Richard, as usual, shot great with his Dasher. Robert (Hoppe) shot well as did Darryl Kightlinger and Everet Smith, whom we call the ‘Shasta Locomotive'”. Below are preliminary results provided by Lynn Dragoman. Share the post "Don Nielson Wins 2010 NBRSA 600-Yard Championship"
After Olympian Kim Rhode, Ace handgunner Jessie Abbate is probably the most popular and marketable female shooter in America. A member of Team Glock for many seasons, Abbate split with the Austrian pistol-maker after Glock refused to allow her to wear a secondary sponsor’s logo on her competition jersey. Now all the major action shooting sponsors will be vying for Jessie’s services. Smith & Wesson will likely pursue Abbate, but Jessie might end up with Sig Sauer whose team is lead by multi-time National Champion Max Michel. 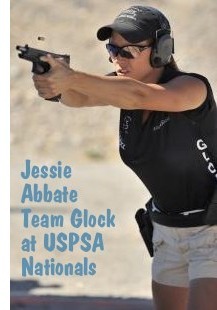 If Sig can sign Abbate, Sig Sauer would arguably have both the #1 male shooter and #1 female shooter on the same squad. On DownRange.TV, Paul Erhardt notes: “Now that the women’s division shooting powerhouse has said Auf Wiedersehen to the Haus of Glock, the question is who will [sign her]? Smith & Wesson — This is the obvious #1 choice. If I were [S&W’s team managers], I’d be hell bent for election to sign Jessie. The 158 year-old juggernaut has already assembled a very strong shooting team, the largest of any firearms company. They are still smarting from having lost out on Max Michel who went to Sig due to bad timing with S&W’s budget year. Share the post "Jessie Abbate Drops Glock — Potential Sponsors Line Up"
On Wednesday, April 28, the Shooting USA TV show reprises its special “Old Sniper” broadcast. 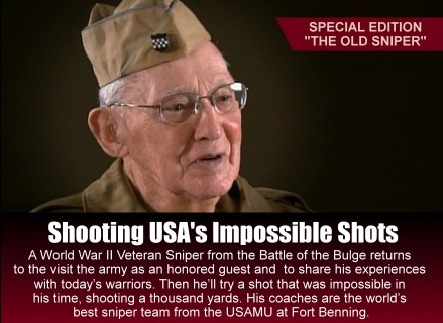 In this popular episode, 84-year old WWII veteran Ted Gundy, who served as a U.S. Army sniper in the Battle of the Bulge, meets with the U.S. Army Marksmanship Unit (USAMU) at Fort Benning. 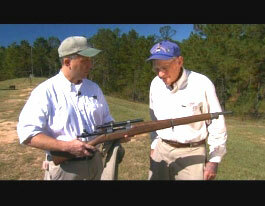 For a week, the “Old Sniper” (and his son) were honored as VIP guests of the USAMU at Fort Benning. At the end of the show Gundy received a new replica of the 1903 Springfield A4 Sniper rifle. The rifle, complete with vintage-type scope, was presented by Val Forgett of Navy Arms. Then, shooting from a rucksack rest, Gundy proceeded to hit steel at 300 yards. CLICK HERE for Full Story with details. This Shooting USA Special broadcast helps viewers remember our remaining WWII veterans, while showing the dedication and hard work of the modern-day USAMU. Broadcast times (on the Outdoor Channel) are shown below (check your local listings). Share the post "‘Old Sniper’ Honored in Shooting USA Repeat Episode"
Sporting Classics, a specialty publisher, has released a new edition of 45 true-to-life Jack O’Connor stories from the pages of Outdoor Life, Field & Stream, Petersen’s Hunting and other popular magazines of his day. The new book, Classic O’Connor, is a sequel of sorts to Sporting Classics’ popular compendium, The Lost Classics of Jack O’Connor. 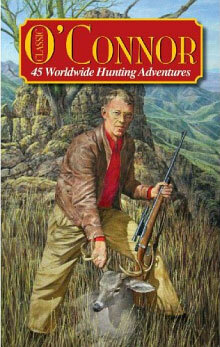 In the new 440-page book, Jack O’Connor recounts his worldwide hunting adventures, during which he pursued everything from ducks to grizzlies, pheasants to kudu. Classic O’Connor presents several of the author’s greatest gun stories and a large selection of never-before-published photographs of the celebrated sportsman and his family on hunting adventures around the world. The book is illustrated with 40+ drawings by acclaimed artist Ron Van Gilder. Hardcover with dust jacket, the book lists for $35, but it can be pre-ordered on Amazon.com for just $23.10, with an August 1st delivery date. To get the book a soon as possible, call Sporting Classics at (800) 849-1004 or visit www.sportingclassics.com. 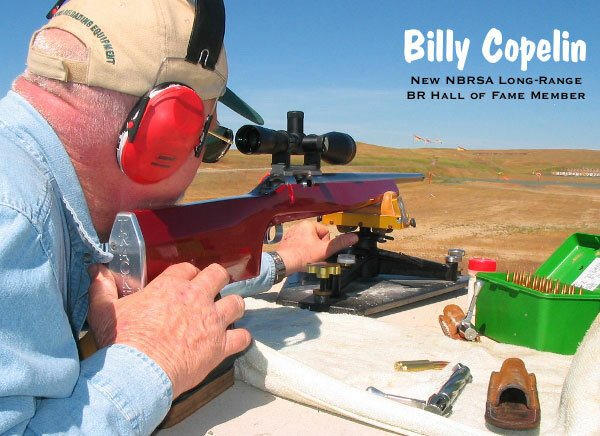 Share the post "Classic Jack O’Connor Stories Collected in Hardback Book"
If you’re planning to attend the 2010 National Matches at Camp Perry, Ohio, or if you just want to learn more about this “mother of all rifle matches”, you should download the FREE 2010 National Rifle and Pistol Championships Program and Entry Information Guide. This comprehensive 100-page digital publication (PDF) is chock full of helpful content, including maps, schedules, lists of nearby facilities. and entry information. The Camp Perry Program Guide also includes complete courses of fire and rules for the numerous firearm classes and various events. Anyone involved in competitive smallbore or high power shooting will find many things of interest in the 2010 Camp Perry Program Guide, even if you can’t make it to Ohio this summer. 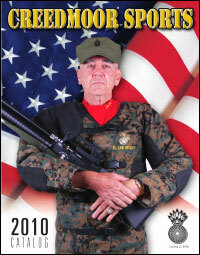 Share the post "Download 2010 National Match Program and Entry Info"
With the Cerberus-owned Freedom Group family of companies preparing for an IPO later this year, industry experts wondered: “Will Cerberus purchase a handgun manufacturer, or launch a line of Remington handguns?” With the announcement of the new Remington 1911 R1 pistol, Cerberus has showed its hand. The new 1911 R1 is the first pistol Remington has produced in decades, and the first 1911-design in 91 years. 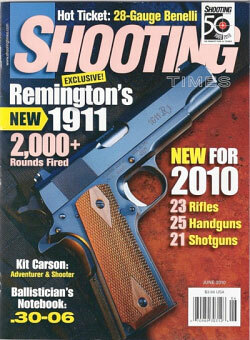 Remington’s 1911 R1 is featured in the current issue of Shooting Times (left). A blued-steel retro design, the Remington 1911 R1 is faithful to the 1911 A1 with some modern upgrades. Like the original 1911, Remington’s R1 has a flat mainspring housing, internal extractor, short trigger and double diamond grips. Modern enhancements include a flared ejection port, beveled magazine well, loaded chamber indicator, tall single-dot front and two-dot rear sights, and a black-oxided stainless barrel. The 1911 R1 also has a Series 80-style firing pin block safety. From a subjective standpoint, this Editor likes the looks of Remington’s 1911 R1 and I favor some of its design features. I personally can shoot 1911s better with the short trigger, and I prefer the clean look of a slide without forward serrations. However, I question the decision, based on styling, to use an internal extractor, and the tall blocky sights look somewhat out of place on a retro-styled 1911. However, the big sights will unquestionably help the gun’s shootability. 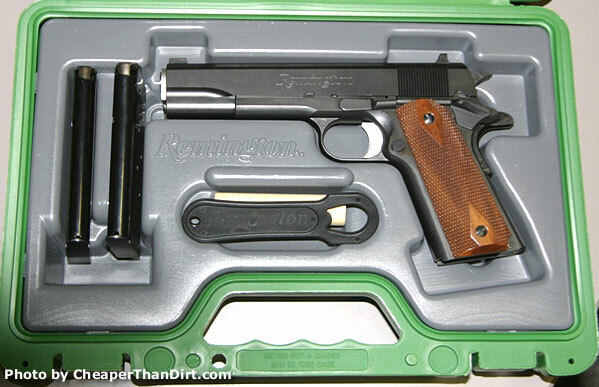 Remington’s 1911 R1 will be officially launched at the NRA Annual Meeting in NC in May. The gun, which is made in Remington’s Ilion, NY facility, should be available in June, 2010, and dealers are already taking advance orders. The Remington 1911 R1 will be shipped in a custom carry case with two 7-round magazines and a barrel bushing wrench (see photo below). Suggested retail price is $699.00. Do We Need Yet Another 1911? It’s easy to be cynical about Remington’s entry into the 21st-century handgun market. Rather than give us something new and really remarkable, Remington merely recycled the tried and trued 1911, a design that is already produced by dozens of companies. Do we really need yet another 1911? One clever gun writer joked: “‘1911′ is supposed to be the model name, not the number of companies building versions of it.” Does Remington bring anything to the marketplace that one can’t buy elsewhere? 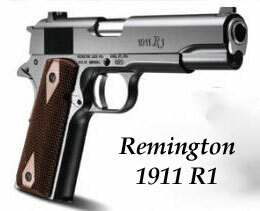 Well, 1911 fans like the pricing of Remington’s 1911, predicting it will sell very well at the $700.00 mark. And Remington does have a history of producing 1911 handguns for the U.S. Military — Remington-UMC built 21,677 1911s for the U.S. Ordnance Dept. in 1918. Share the post "Remington Releases 1911 R1 Pistol"
MidwayUSA was able to take advantage of a Special Buy on factory-blemished bullets. These bullets have slight cosmetic defects that should not alter performance. 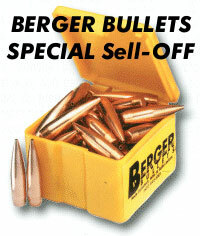 These blem bullets will be sold on a first-come, first-served basis, with sale prices in effect through April 30, 2010. MidwayUSA shows a 6.5mm (.264) 129gr poly-tip (probably a Hornady) on sale, but it appears the 129s may have sold out already. 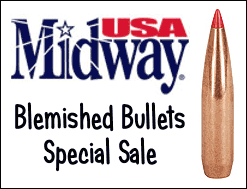 Share the post "MidwayUSA Blemished Bullets Sale — Big Savings"
Robert Hoppe, one of the top 600-yard shooters in the country, was the 2009 NBRSA 600-yard champion. In 2007, shooting a 6 Dasher, Robert nailed a 0.5823″, 5-shot group. 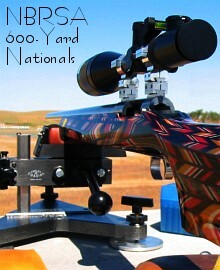 At the time it was the smallest group ever shot in 600-yard registered benchrest competition. In 2008, John Lewis shot even smaller with an IBS Heavy Gun, but Robert’s 0.5823″ still remains the NBRSA 600-yard record, and we believe it is the smallest group ever shot at 600 (in registered BR competition) by a 17-lb class rifle. Robert has been very successful in the 600-yard game, and is one of the best 600-yard shooters in the West. He knows how to wring the best accuracy out of the 6mm Dasher cartridge. 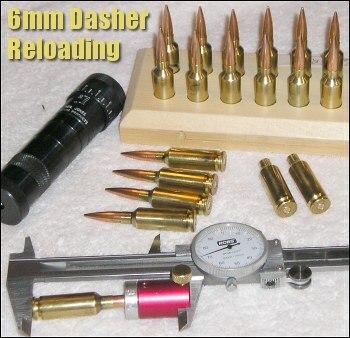 Here Robert offers some tips on load development and tuning for the 6mm Dasher. Share the post "6mm Dasher Load Tuning — Tips from Robert Hoppe"
With a standard AR-15 we’ve never had problems with the standard coil-spring-equipped buffer system (other than the annoying spring noise). But with the AR-15’s big brother, the heavier-recoiling AR-10, an enhanced buffer system is welcome. A upgraded buffer won’t reduce recoil force, but it can soften the perceived recoil pulse, allowing the shooter to get back on target more quickly while reducing shooter fatigue over an extended string of fire. 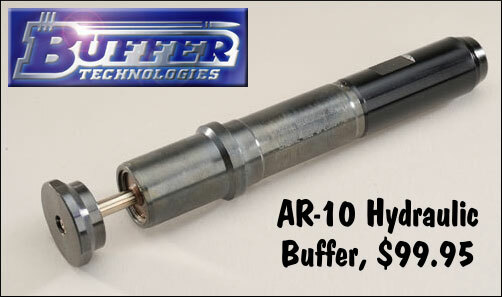 Buffer Technologies of Jefferson City, MO, has introduced a new hydraulic buffer for AR-10-type rifles. Priced at $99.95, the hydraulic buffer weighs 0.38 pounds, has a 5.8-inch compression length, and fits AR-10s with full-length buttstocks. The buffer, crafted from black-oxided steel and black-anodized aluminum, is optimized for use with the .308 Winchester cartridge. Share the post "New Hydraulic Buffer for .308-Win AR-10 Style Rifles"